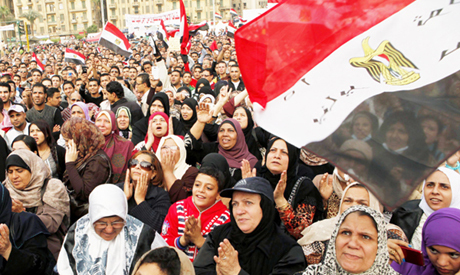 More than one hundred activists signed a statement on Monday rejecting President Morsi's recent constitutional declaration and the new constitution. Prime Minister Hisham Qandil has said the declaration will be cancelled if the constitution is passed by a national referendum on 15 December. The revolutionaries said they would not accept an "undemocratic" constitution that "lacks basic rights" in order to cancel a "power-grabbing declaration." Moreover, they said they would not be forced into choosing between Islamists and members of the former regime, and refused to be represented by opportunistic members of the former regime who oppose the Brotherhood. The activists also rejected the "forced" polarisation between secularists and Islamists, used by both camps for political gain. They said they stood with those who support the revolution and did not base their position on the Islamist-secularist divide. The statement was signed by members of the Strong Egypt Party, Kazeboon (anti-military rule campaign), Doctors Without Rights and the Socialist Popular Alliance Party, as well as rights organisations, independent academics, artists, activists and intellectuals. Islamists have accused members of the growing movement against the constitutional declaration of being guided by former regime figures seeking revenge against the Brotherhood and other Islamists. Revolutionaries have disregarded this as counterpropaganda.